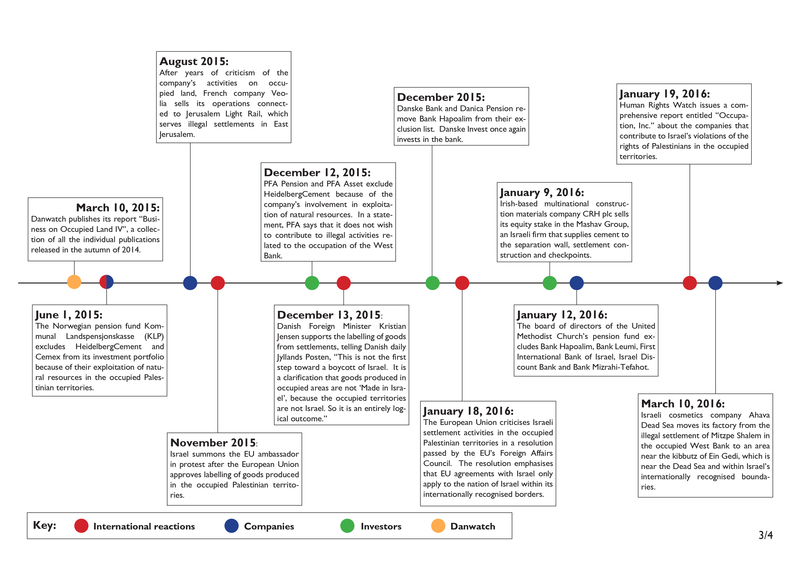 Over the course of many months Danwatch has investigated European pension funds and their investments into Israeli and international companies with activities in and around illegal Israeli settlements. In this first chapter we look closely at the Israeli banks, which continue to finance new construction projects in the occupied Palestinian territories despite decades of clear condemnation of illegal settlements by the international community. The banks say they comply with Israeli law. 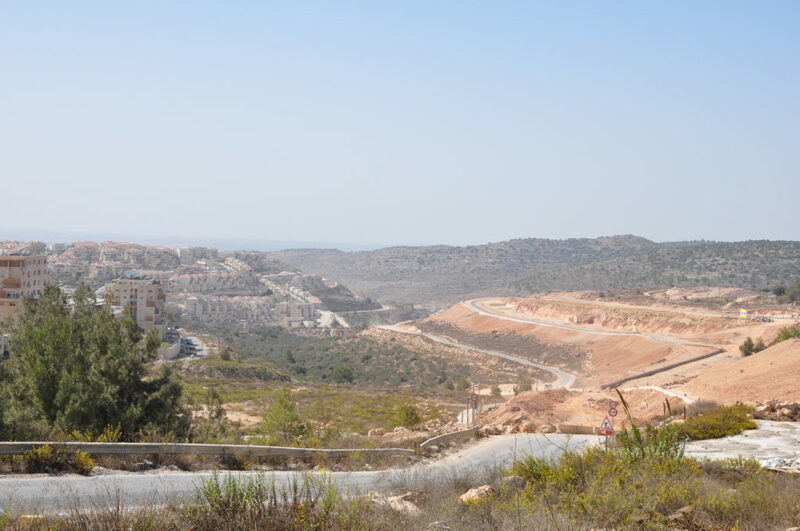 Danwatch visited one of the fastest-growing Israeli settlements in the West Bank. Europe’s five largest pension funds have combined investments of €7.5 billion in companies with business activities in and around illegal settlements in the occupied Palestinian territories. This is at odds with United Nations guidelines, clear warnings from 18 European countries, and undermines the two-state solution, experts warn. The little square outside the mall in the town centre is bustling with activity. The Jewish holiday of Sukkot is right around the corner, so stalls in the square in front of the mall sell palm leaves and fruit. Families celebrate Sukkot by building small, temporary shelters (often on porches or balconies) decorated with fruit hanging from a roof of palm branches. The shelters symbolise the Jews’ wanderings through the desert on their way to the Holy Land, while the fruit symbolises the harvest season. We are in the town of Beitar Illit, whose 50,000 inhabitants make it one of the largest Israeli settlements in the occupied Palestinian territories. 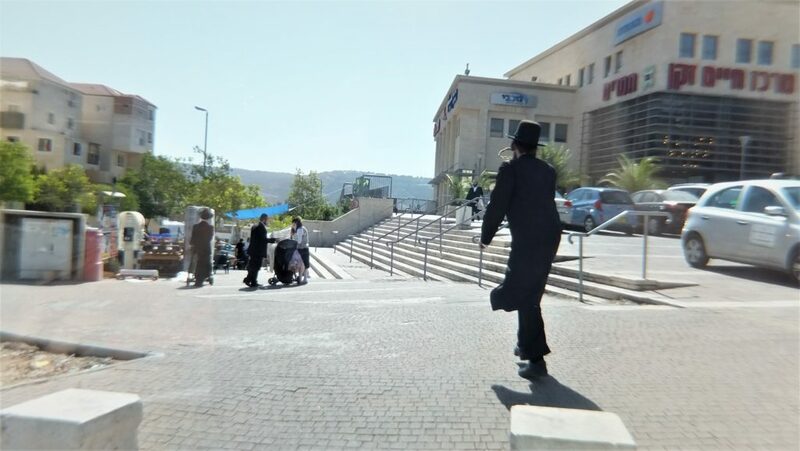 Unlike most other settlements, almost all of Beitar Illit’s residents are ultra-orthodox Jews for whom religion play a vital role in their life. The men in Beitar Illit are dressed in black suits, white shirts, and black hats. Nearly all of them have beards, and many have long ringlet curls at their temples. The women’s clothes are more colourful, but they still dress conservatively, with long dresses and scarves to cover their hair. Most of the young boys wear the kippa, the traditional Jewish head covering. Danwatch has travelled to the occupied West Bank to follow up on our 2012 and 2014 investigations entitled Business on Occupied Territory. As before, we are investigating Israeli and multinational companies that cause, contribute to, or are associated with violations of international humanitarian law or human rights in the occupied Palestinian territories, as well as European investments in these companies. 2. Alon Blue Square Israel Ltd.
We have identified European investments in a number of Israeli banks that finance, support, and facilitate illegal settlements. For this reason we have travelled to Beitar Illit, one of the fastest-growing settlements in the West Bank, where 218 new housing units are now under construction. We stand out from the crowd in the square near the mall. I have driven to Beitar Illit with my local translator, Khaled, who speaks both Hebrew and Arabic. Khaled has been an activist in occupied East Jerusalem for years, and spent time in prison because he refused to serve in the Israeli army. Although he has had several run-ins with Israeli authorities and settlers, he has never been in an ultra-orthodox settlement before, and is a bit nervous about how people will react to my questions. He insists, therefore, that our taxi driver keep the motor running so that we can make a quick getaway if there are any problems. The people in the square are largely indifferent to us, however. A few cast curious glances our way, but most are too busy to pay us any attention. After a few attempts, we engage a young man in conversation. His name is Yisrael, and he is 31 years old. He will not give us his surname, but he is happy to answer questions about life in Beitar Illit. Yisrael tells us that he has lived in Beitar Illit for ten years. He moved here from Jerusalem, which he still visits almost daily as part of his religious practice. He says that he chose to move to Beitar Illit because it was so inexpensive, and he enjoys life here with his five children because they have a high quality of life and there are lots of jobs. The easy transport to Jerusalem is also important to him. I ask Yisrael about the fact that he lives in a settlement that the entire international community has condemned as illegal according to international law, and if this is something he gives much thought to. “No,” he says, looking me straight in the eyes. I modsætning til de fleste andre bosættelser, så er stort set alle indbyggere i Beitar Illit ultraortodokse jøder, for hvem religion spiller en altoverskyggende rolle. We speak with several other locals in the square in Beitar Illit and hear very much the same story. Another man, who will not give his name, explains that he moved to the town from Tel Aviv seventeen years ago. He does not see it as a problem that he lives on the other side of the Green Line, a common name for the armistice line of 1949. The international community considers the Green Line to be the border between Israel and the occupied Palestinian territories. “Beitar Illit is not on the wrong side. We Jews have a connection to Judea and Samaria (West Bank, ed.) that goes back thousands of years, so we see nothing wrong with living here,” he says. The third person we speak with is David Bloy. He is 41 and has lived in Beitar Illit for twenty years. He moved here from a different West Bank settlement, Kiryat Arba. “It’s wonderful to live here. I don’t miss Kiryat Arba. I live in a nice house, and there’s good education for my children here,” Bloy tells me in Hebrew via translation. Their answers are consistent with figures from the Israeli NGO Peace Now, which asked settlers in 2007 about their reasons for living in settlements. A majority, 77%, answered that quality of life, affordability or proximity to other Israeli cities was their primary motivation. 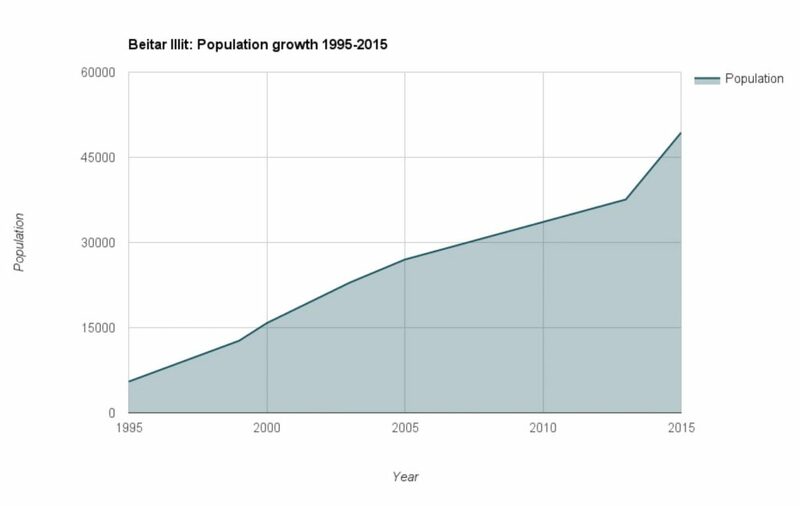 That’s a large part of the explanation why the rate of population growth in West Bank settlements in 2015 was twice that in Israel. According to the Israeli Ministry of Construction and Housing, 90 out of a total of 131 official settlements in the West Bank are classified as “areas of national priority”. This classification is normally reserved in Israel for cities that are economically distressed or near borders. Being categorised as an area of national priority comes with a number of advantages, such as reduced land prices, preferential loans, subsidies for home buyers and investors, and reduced income tax for both individuals and companies. to improve economic resilience in these communities. Nearly one-third of Israel’s housing construction budget is spent in the occupied territories, and over the last ten years, 28% of the homes subsidised by the Ministry of Construction and Housing’s “Rural Affairs Administration” were built in settlements, according to figures analysed in 2015 by the Israeli newspaper Haaretz. The current map of areas of national priority was approved by the government in January 2012 under Prime Minister Benjamin Netanyahu. The declared purpose of the funding is “to encourage positive immigration to the communities and to strengthen their economic resilience,” wrote Haaretz. Next to the Israeli settlement Beitar Illit lies the Palestinian village of Wadi Fukin, and even along the short drive from Beitar Illit to Wadi Fukin, the contrasts are apparent. We leave the settlement’s attractive streets to find the entrance to the Palestinian village, which is through an auto mechanic’s shop. This winding path into the valley is the only way to reach Wadi Fukin, since every other one of its roads has been cut off by Israeli settlements. Wadi Fukin is a fertile little village with about 2,000 inhabitants. Greenhouses and green fields are everywhere. The Palestinians who live here grow many different crops, and the village is known throughout the West Bank for the high quality of its fruit and vegetables. However, the expansion of the settlements surrounding the town threatens its agriculture, since the settlers release sewage into the valley. In addition, the army often closes the village entrance, or seals off areas or roads in the village, making it hard to grow, harvest and transport the crops to market. Crops of Wadi Fukin with the settlement of Beitar Illit in the background. Sewage and waste water from the settlement of Beitar Illit trickling down into Wadi Fukin. Settlers intimidate citizens of Wadi Fukin. Palestinian children during a protest against the cutting down of olive trees. Palestinian school girls with the settlement Beitar Illit in the background. In the communal building in the centre of the town, Mayor Ahmad Sokar receives us. At 34, he must be one of the youngest mayors in the West Bank. Normally, this post is filled by an older man, but when Sokar begins to speak, we quickly understand why the residents of the town have chosen him to represent them. “When I was born in 1982, there was no Beitar Illit. The town didn’t exist. There were no settlers, and we and the other villages in the area used the land for our crops and livestock,” says Sokar. “I was three years old when the first settlers came. No one asked our permission. They just confiscated the village’s land and began building houses for settlers. Now there are 50,000 settlers, and we are nearly surrounded on all sides,” he says, pointing out the last empty piece of land on the hillside, which will soon be filled with the white stone houses of Beitar Illit. Sokar has a lot to say about the problems that come with being enclosed on all sides by settlements. “They throw garbage and spill sewage down the hill, and Israeli soldiers and settlers often cut down our olive trees and keep us from working the land around the village,” says Sokar. Wadi Fukin’s troubles with settlers has also been covered elsewhere, most recently by Israeli journalist Amira Hass in her article “Armed and entitled, Israeli hikers sow fear in Palestinian farming village” in Haaretz. While Beitar Illit and the other settlements in the West Bank are fully integrated into Israeli society, with garbage collection, water and electric utilities, bus routes, road signage and good infrastructure, the Palestinian villages under Israeli control are often completely neglected. While settlers in Beitar Illit can easily drive to Jerusalem, Tel Aviv, and other Israeli cities, the residents of Wadi Fukin have a difficult time even visiting the nearest Palestinian villages because of the infrastructure and security zones around the Israeli settlements. The centre of Wadi Fukin, 3 %, is located in Area B, where civil services are the responsibility of the Palestinian Authority, while the remaining 97 % of the village is under total Israeli control. After the Oslo accords of 1994, the West Bank was divided into three areas: A, B and C.
Area C (60%) is under full Israeli control. The division was intended to be a temporary solution while the Israelis and Palestinians completed peace negotiations, but it has ended up being permanent. Michael Lynk emphasises that according to international humanitarian law, as an occupying power, Israel is responsible for the population under its control. The Israeli settlement Beitar Illit and the Palestinian village Wadi Fukin. While Beitar Illit enjoys full integration into Israeli society with easy access to Jerusalem, e.g. via numerous bus lines, Wadi Fukin is almost closed off from even neighbouring Palestinian towns. “It deprives Palestinians of their property and sources of livelihood, restricts their access to services, and creates a range of protection threats that, in turn, have triggered demand for assistance and protection measures from the humanitarian community,” writes OCHA. The outgoing US Secretary of State, John Kerry, recently described how Area C – which constitutes 60% of the West Bank – is completely closed off to Palestinian development, even though the Oslo accords decreed that the area should have been transferred to Palestinian control long ago. “In fact, almost no private Palestinian building is approved in Area C at all. Only one permit was issued by Israel in all of 2014 and 2015, while approvals for hundreds of settlement units were advanced during that same period,” said Kerry on December 28, 2016. Ahmad Sokar’s description of life under occupation with settlers as his village’s immediate neighbours is consistent with the harsh words the UN has had for Israel’s policies in the West Bank. “There are more than 200 settlements and nearly 600,000 settlers in the West Bank, and the Israeli government plans to take over all of Area C, about 60% of the West Bank. How will we ever get an independent state when they keep stealing our land?” asks Sokar. Ninety-seven percent of Wadi Fukin is in Area C. This means that its residents must apply for permission from the Israeli authorities for all initiatives in construction, agriculture, infrastructure, water, electricity, etc. According to Sokar, the Israeli authorities are very strict, which is why there are currently fifteen court cases in progress between the residents of Wadi Fukin and the Israeli authorities. “For example, we wanted to build a little park with a playground and football field for the children in the village, but the Israelis quickly confiscated the area in order to expand the settlements and the wall. That is our reality,” he explains, while the sounds of Friday prayers from the local mosque and the noise of the settlers’ construction vehicles compete in the background. Since Beitar Illit was founded in 1985, Mayor Sokar has seen the settlement grow at a record pace. 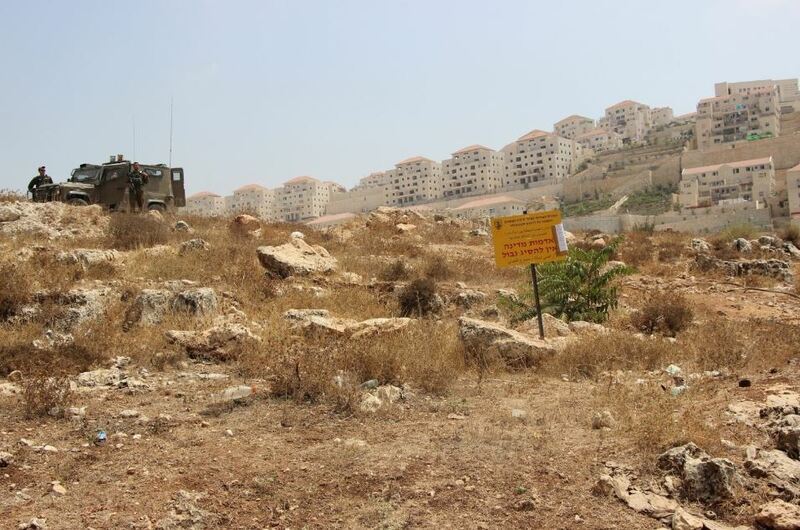 The latest expansion was approved in 2014, when the Israeli government in the aftermath of the kidnapping and killing of three settlers declared 400 hectares of the area to be “state property”, and invited bids from Israeli developers. According to the Israeli NGO Peace Now, this was the largest confiscation of Palestinian territory since the 1980s. According to the Israeli government’s “Greater Jerusalem” plan, Beitar Illit is a part of the Gush Etzion settlement bloc that also includes Neve Daniel, Keidar, Rosh Tzurim, El’azar, Migdal Oz, Allon Shevut, Kfar Etzion, Bat Ayin, Efrata and Gva’ot. According to the plan, these settlements should expand in future years, which presents a serious problem not only for Wadi Fukin, but also for other Palestinian towns in the area, such as Al Jab’a, Nahhalin, Husan, Al Wallaja and Battir. For Beitar Illit, the new plan means that the settlement will grow to almost double its size, with 5,000 new houses in addition to the 8,000 already in place. For the residents of Wadi Fukin, the expansion of Beitar Illit on Hill C is catastrophic, since it means they will be almost entirely surrounded. When the industrial zone on the other side of the village is complete, the only way in and out of Wadi Fukin will be directly through a settlement. We leave Ahmad Sokar and drive to the construction site on the hilltop. The rhythmic blows of the heavy machinery become louder and echo throughout the valley as the Friday prayers from the mosque in Wadi Fukin become fainter. There is little to see as of yet besides gravel excavation, but the sign at the entrance to the construction site declares that a series of Israeli developers are building 218 new homes. “The Ministry of Construction and Housing and the municipality of Beitar Illit, in cooperation with Adi Hadar Company, are building new roads and infrastructure – Phase A for 218 housing units,” the sign says in Hebrew. 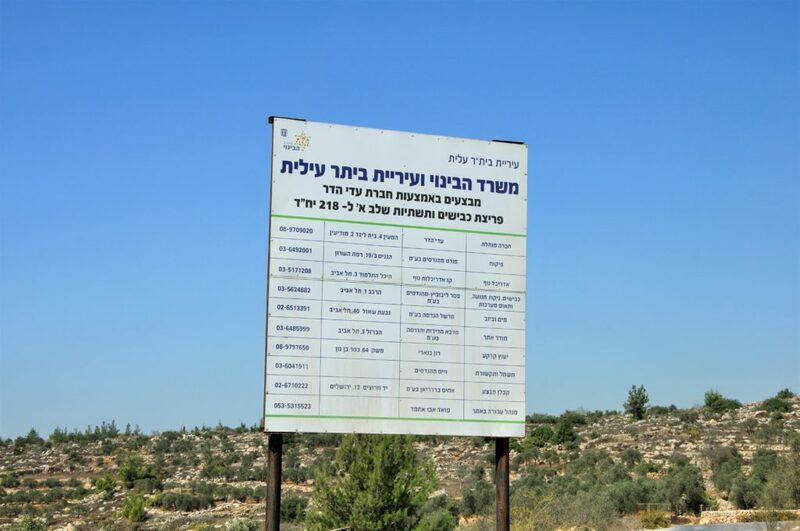 The sign includes information about all the project’s contractors, architects, sanitation and electricity authorities, as well as the site administrator. But it lacks the names of the project’s most important partners: the Israeli bankers who are financing the project. According to the Association of Banks in Israel, the trade organisation for Israeli banks, the Sale Law of 1974 (Assurance of Investments of Persons Acquiring Apartments) requires all Israeli developers to have a bank as a partner in construction projects. This means that the development in Beitar Illit, like all other home construction projects, must be guaranteed by one or more banks from start to finish in order to protect the investments of home buyers via guarantees and insurance. With the help of a local Israeli research organisation, Danwatch identified Bank Hapoalim and First International Bank of Israel (FIBI) as the two Israeli banks acting as guarantors for the expansion of Beitar Illit on Hill C.
The expansion of Beitar Illit is just one of many construction projects in which Bank Hapoalim, FIBI, and other Israeli banks are involved. Bank Hapoalim has granted loans and guarantees to several large Israeli developers that are building in the occupied Palestinian territories, including Heftzibah and Shikun & Binui, which have helped build checkpoints, the separation wall, as well as homes and infrastructure in the settlements of Har Homa, Ramat Shlomo, Ariel, Imanuel, and Modi’in Illit. Shikun & Binui is excluded by the Norway Government Pension Fund Global, Europe’s largest pension fund. For banks like Hapoalim, there is no difference between the two sides of the Green Line, which the international community recognises as the border between Israel and the occupied Palestinian territories. For Bank Hapoalim, for instance, this means that in addition to loans and guarantees for construction in the occupied Palestinian territories and mortgages to Israeli home buyers in the settlements, the bank also has branches in the settlements of Ariel, Beitar Illit, Modi’in Illit, Ma’ale Adumim, Pisgat Ze’ev, Gilo and Ramot. Bank Hapoalim also provides loans and financial services to local authorities and businesses in the settlements. Israeli banks claim they are merely following Israeli law, but according to an independent but unpublished legal opinion obtained by Danwatch, Israeli law does not require banks to have as robust a presence in the settlements as they currently do, either. It is true that banks may not discriminate, but they are neither obliged to finance construction projects nor to have branches or offer mortgages and loans to settlers, businesses or authorities in the occupied territories, as the Association of Banks in Israel claims. The Israeli banks’ activities in occupied areas are at odds with the United Nations Guiding Principles on Business and Human Rights, according to Cathrine Bloch Veiberg, an expert in human rights and corporate social responsibility at the Danish Institute for Human Rights. She emphasises, however, that she does not know the details of the banks’ involvement. “When Israeli banks directly finance the building of settlements in the West Bank, they do so in conflict with international law. It is thus difficult to say that financing settlement isn’t in conflict with the banks’ responsibility to respect human rights,” explains Bloch Veiberg. Steen Vallentin, associate professor and PhD at Copenhagen Business School specialising in corporate social responsibility, and board member of Danwatch, has the same assessment. “Investors have a major explanation problem when it is so clearly documented that the Israeli financial sector directly funds activities that are in violation of international law. If investors see these problems and yet still invest in banks, what will we not invest in? Where will they draw the line,” he asks. Several of the largest European pension funds and banks have responded to the activities of the Israeli banks in occupied territories by excluding them. Among these is the third-largest pension fund in Europe, PFZW (formerly PGGM), which decided in 2014 to pull all its investments out of Israel’s five largest banks because they finance settlements and operate branches in the West Bank. “Given the day-to-day reality and domestic legal framework they operate in, the banks have limited to no possibilities to end their involvement in the financing of settlements in the occupied Palestinian territories,” wrote PGGM of its decision to exclude Bank Hapoalim, Bank Leumi, First International Bank of Israel, Israel Discount Bank and Mizrahi Tefahot. In February 2014, Danske Bank, Denmark’s largest bank, also placed Bank Hapoalim on its exclusion list of companies in which it no longer would invest. At the time, the bank said that the Israeli settlements were in violation of international law, and that Danske Bank did not wish to invest in businesses that contributed to such violations. At the end of 2015, however, Danske Bank quietly removed Bank Hapoalim from its exclusion list. When questioned by Danwatch, Danske Bank replied that its decision was based on a “thorough and constructive dialogue regarding the settlements”. According to its most recently released stock portfolio, Danske Bank now has investments totalling approximately €75,500 in Bank Hapoalim and €125,000 in Bank Leumi. Germany’s largest bank, Deutsche Bank, placed Bank Hapoalim on a list of “ethically questionable” investments in 2014, without formally excluding it. 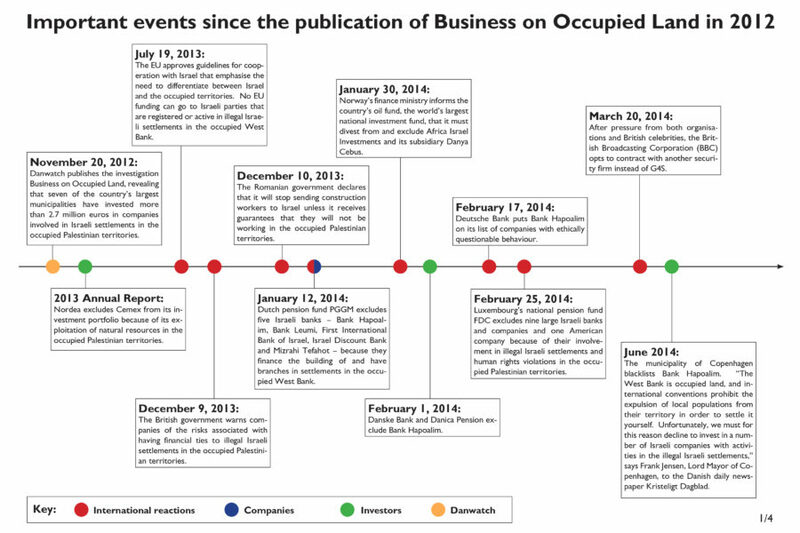 Israeli banks’ activities on occupied Palestinian land directly contribute to negative impacts on Palestinian human rights, and European investors increasingly acknowledge the issue. But are the banks’ activities actually illegal, such that both they and their investors could be convicted in court? 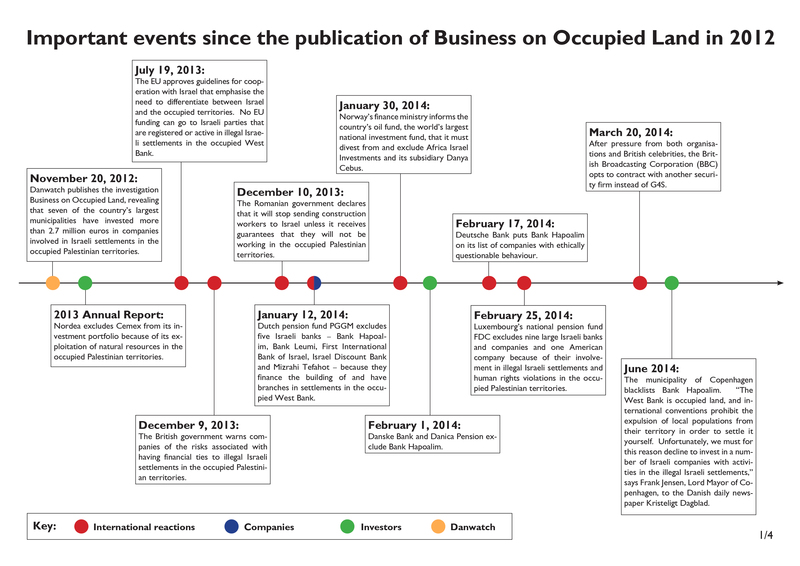 Danwatch contacted a number of experts to obtain their opinions with respect to the legality of the banks’ activities in the occupied Palestinian territories. One of these is Richard Falk, Professor Emeritus at the Woodrow Wilson School of Public & International Affairs at Princeton University and former United Nations Special Envoy to the occupied Palestinian territories. He has examined the question of corporate responsibility in the occupied Palestinian territories, and believes that the Israeli banks clearly share responsibility when they finance settlements. “It’s a violation of international criminal law that requires private sector actors not to be knowingly complicit in violation of the Geneva Conventions and international treaties. And since settlements directly violate the fourth Geneva Convention, it has been assumed that having corporate or financial relations with projects connected with settlements is a likely to be considered a violation of international law,” Richard Falk tells Danwatch. Israeli banks defend themselves by saying that they are just complying with Israeli law, but what about the investors’ responsibility when the Israeli and international legal codes are not aligned regarding the legality of settlements? Cathrine Bloch Veiberg, expert in corporate responsibility, is not in doubt. According to the UNGP, states have a responsibility to protect human rights, and companies have a responsibility to respect human rights even when states fail to do so. In fact, Richard Falk, Professor Emeritus in international law at Princeton, agrees with the banking organisation’s legal argument, but not with its opinion. “You and I can’t decide what the law is, although we can speculate about what a court will and should do,” he says. In his opinion, however, there is no doubt. “A properly-functioning International Criminal Court should certainly find that banks that were engaged in these kinds of connections with settlements for profit were violating international criminal law,” Richard Falk tells Danwatch. Steen Vallentin, an expert in corporate social responsibility at Copenhagen Business School, says that in the end, the debate is not about the law at all. It is about the ethical and social norms to which the investors themselves claim to adhere. “The law is always the first defence for businesses with questionable activities, but that’s not at all what the debate is about. The whole point isn’t whether it’s legal or not,” he says. Danwatch would have liked to ask Bank Hapoalim about its activities in the occupied Palestinian territories, but the bank chose not to reply to our questions. Danwatch have talked to Hapoalim, but its representatives chose not to go on record. 1. Can you confirm that Hapoalim is involved in this project on occupied Palestinian territory through its guarantee to the Bradarian Brothers LTD, which is the implementing contractor? 2. Is Hapoalim currently financially involved in any other projects on occupied Palestinian territory? 3. 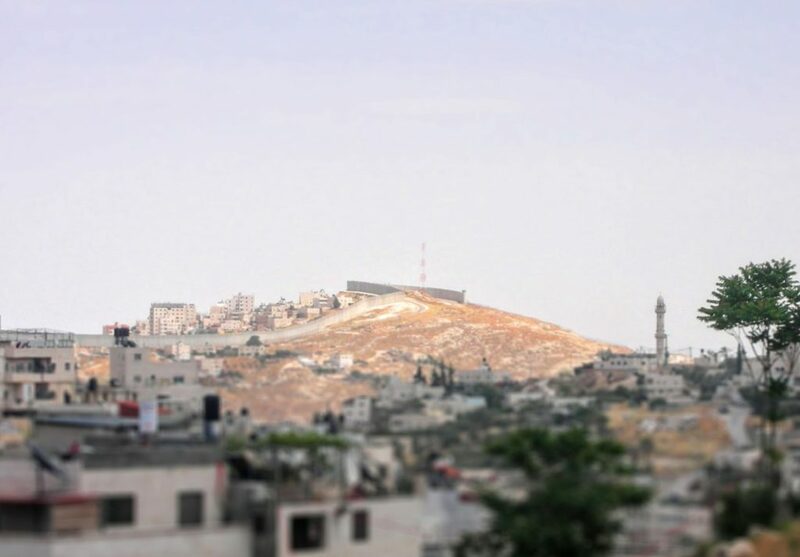 Settlement construction on occupied Palestinian territory (like the expansion of Beitar Illit) is against international law and condemned by the entire international community – why does Hapoalim chose to be engaged in these projects? 4. Is Hapoalim forced to finance settlement construction by Israeli law? 5. Is Hapoalim forced to have branches in settlements and offer services to settlers by Israeli law? 6. Israeli and international law differ on many points regarding settlements – how does Hapoalim try to mitigate between the two? 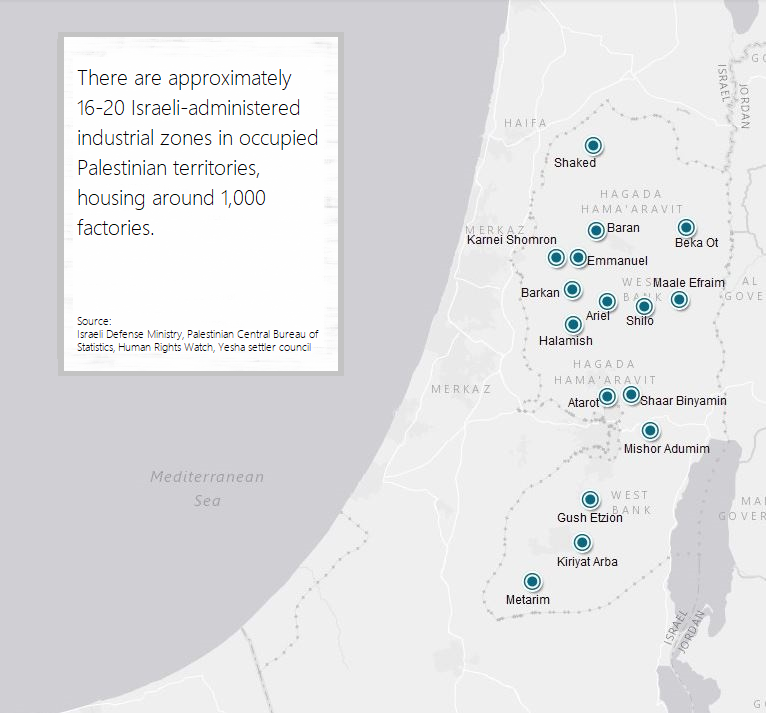 About 1000 Israeli and international firms enjoy lower taxes and property costs in some twenty illegal industrial zones spread across the West Bank. The companies are a vital part of Israel’s settlement project in the occupied territories because they provide jobs for settlers and pay taxes to settlement authorities. 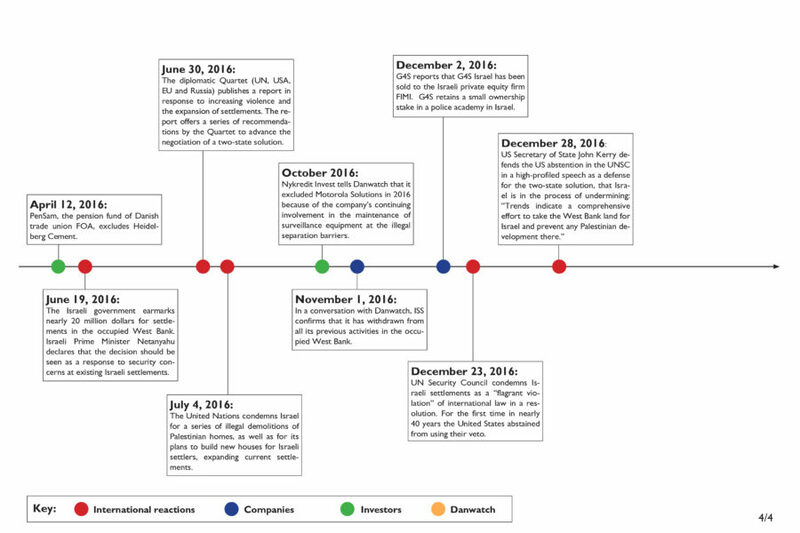 Danwatch investigated the Mexican cement company Cemex, which operates three factories through its Israeli subsidiary Readymix in industrial zones on occupied territory. The truck’s giant drum turns slowly to keep the cement from hardening. It is quiet at most of the factories in the Mishor Adumim industrial zone in the West Bank this Sunday in October, because the Jewish holiday of Sukkot begins at sundown. But at the Readymix cement factory, the machines are still humming. We are in the Jordan Valley, deep in occupied Palestinian territory, but it was not hard to locate the Readymix factory. We found the address on the company’s website, where its three factories in the West Bank are neatly marked on a map. Nor was the trip out here a problem, since, as a practical matter, this industrial zone is functionally a part of Israel; you hardly notice that you have crossed Israel’s internationally recognised borders or driven through occupied Palestinian territory to get here. The roads are as well-maintained as those in Israel, and Hebrew road signs help drivers find their way. The trip from Jerusalem took no more than twenty minutes. Danwatch has come to the Mishor Adumim industrial zone to find Readymix’s factory because it is owned by the Mexican cement company Cemex. The company has been in the public spotlight for years because of its activities in the occupied Palestinian territories. Cemex is one of 36 publicly-listed companies identified by Danwatch that have benefited from European investments worth millions of euro. Of the top five European pension funds two have investments in Cemex; Statens Pensjonsfond Utland (NO), which has €101 million, and Pensioenfonds Zorg en Welzijn (NE), which has €16 million. None of the five European pension funds have excluded the Mexican company, which has business all over the world, including in West Bank settlements that are in violation of international law. Investments in Cemex are problematic because of the company’s activities, which have significant human rights consequences for the Palestinians. This was confirmed by Lars Erlev Andersen, a senior researcher at the Danish Institute for International Studies (DIIS), who believes that business activities in the settlements are generally problematic. Cemex is a large international company with business dealings on four continents, including 66 cement factories, 2000 “ready-mix” facilities, 400 quarries, 260 distribution centres and 80 ports. 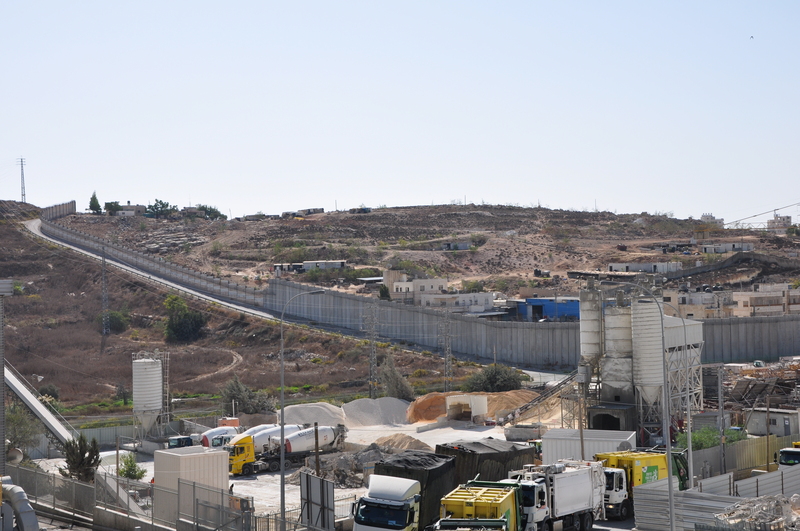 The activities of its Israeli subsidiary Readymix in the West Bank make up only a tiny fraction of Cemex’s total business, but the Mexican company has nevertheless long been under scrutiny, both for operating factories in occupied areas and for supplying cement to a large number of illegal construction projects, such as the separation wall, settlements, and checkpoints, which limit the occupied population’s freedom of movement. 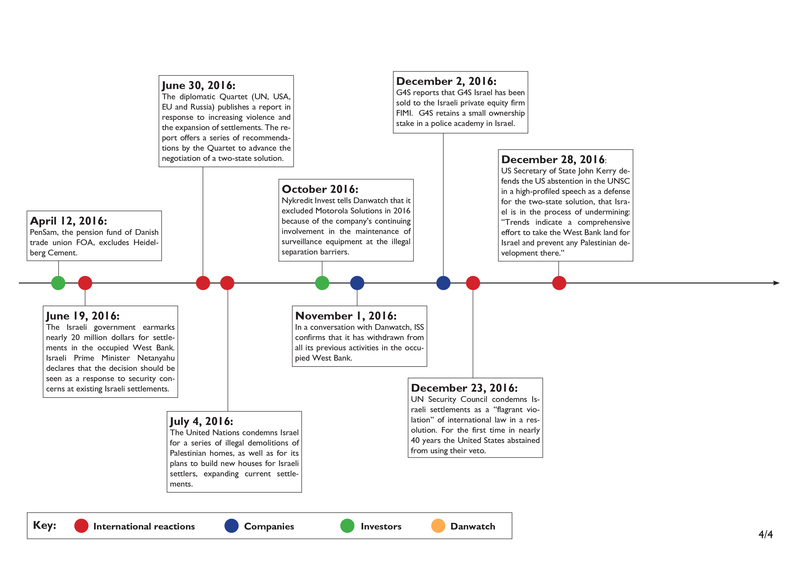 Up until recently, Cemex also owned 50 percent of the Yatir stone quarry in the occupied West Bank, but in September 2015 the company announced that it had sold its share to Kfar Giladi Quarries. Cemex has made repeated statements regarding the criticism of its activities in the occupied Palestinian territories, and said at the time of the sale of Yatir in September 2015 that it does not sell construction materials to illegal settlements. This interpretation of which settlements are illegal, however, directly contradicts the international consensus, which views all the settlements as illegal. Cemex defends its three factories in the occupied territories by saying that they are located in legal settlements that are approved by the Israeli government and sanctioned by the Supreme Court of Israel. This does not change the fact, however, that the United Nations, the European Union, the United States, and all other relevant international organisations view all settlements outside of Israel’s recognised borders as illegal under the Geneva Conventions. 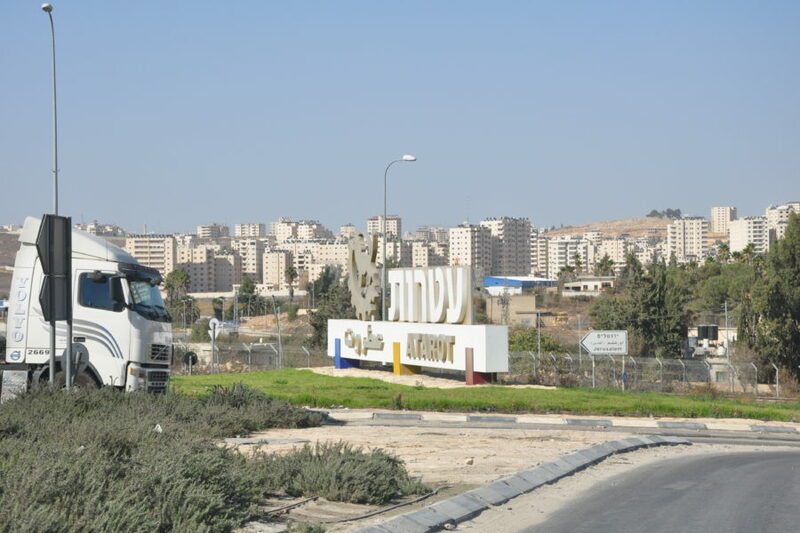 The industrial zone Mishor Adumim, where one of Cemex’s factories is located, is an extension of the settlement of Ma’ale Adumim, which is one of the largest in the West Bank with about 40,000 residents. Approximately 300 companies and small businesses have addresses in Mishor Adumim, and when Danwatch visited in October 2016, there was lively activity in the adjacent construction site where the industrial zone is being expanded. In this investigation, Danwatch is focusing on companies with connections to settlements, and the most direct kind of connection is when a company itself has an address in a settlement. This connection was investigated by the international NGO Human Rights Watch in its comprehensive report, “Occupation, Inc.” Program director, Iain Levine, explained upon publication in January 2016. “Businesses that operate in and around the settlements, which provide goods and services to the settlements, have been an essential backbone of the whole settlement enterprise really ever since the beginning,” he said. Iain Levine, program director in HRW explains. According to Human Rights Watch, it is impossible to conduct business in a settlement without contributing to violations of international humanitarian law and the human rights of Palestinians. We leave Mishor Adumim in the Jordan Valley and drive to the Atarot industrial zone, north of Jerusalem. Located directly adjacent to the separation wall that cuts East Jerusalem out of the West Bank, it holds about 160 Israeli and international businesses. In contrast to the rest of the West Bank, whose military occupation by Israel is now in its fiftieth year, East Jerusalem has been formally annexed since 1967. This means that Israel considers all of Jerusalem as its capital city and a part of Israeli territory, where Israeli law applies to all citizens. In the occupied West Bank, Israeli civil law applies to Israeli citizens, while Palestinians are under the jurisdiction of military tribunals, and have significantly fewer rights. For the same reason, no country in the world has located its embassy to Israel in Jerusalem, even though Israel itself considers the city its capital. Before the second intifada (violent Palestinian uprising against the occupation, ed.) 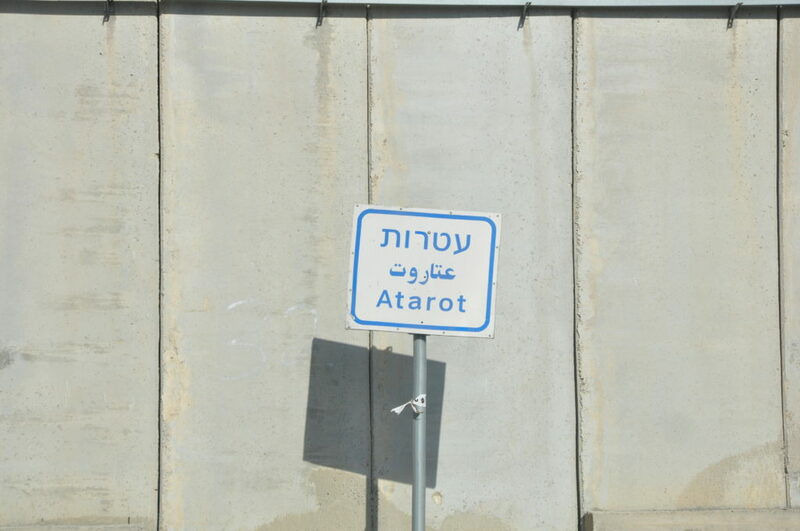 broke out in 2000, the industrial zone of Atarot was hailed as an example of Israeli-Palestinian cooperation. At the time, big names like Coca-Cola, Mercedes-Benz and Israel Aircraft Industries had factories in Atarot along with 200 other companies, of which 40 were owned by Palestinians. These businesses employed a total of 4,000 people, of whom more than half were Palestinians from Jerusalem and the West Bank. Many of the businesses moved away, however, as the intifada escalated in the first years of the millennium, but according to the Jerusalem Development Authority, there has recently been renewed interest in the industrial zone. “Lately, following an upgrading of the park’s physical infrastructure, there has been an unprecedented increase in the demand for land at the site. One of the park’s main advantages is the ease of access for those coming from outside the city as well as from the city itself,” the Israeli authority writes. Atarot is conveniently located only ten minutes from Jerusalem and with easy access to Tel Aviv via the infamous Road 443 – infamous, because it cuts through the West Bank, but cannot be used by Palestinians. We find Readymix’s cement factory in Atarot easily, and can testify to the fact that, as in Mishor Adumim, there is a great deal of activity in the area. The factory is located next to several other cement factories, but despite this, signage is scarce. 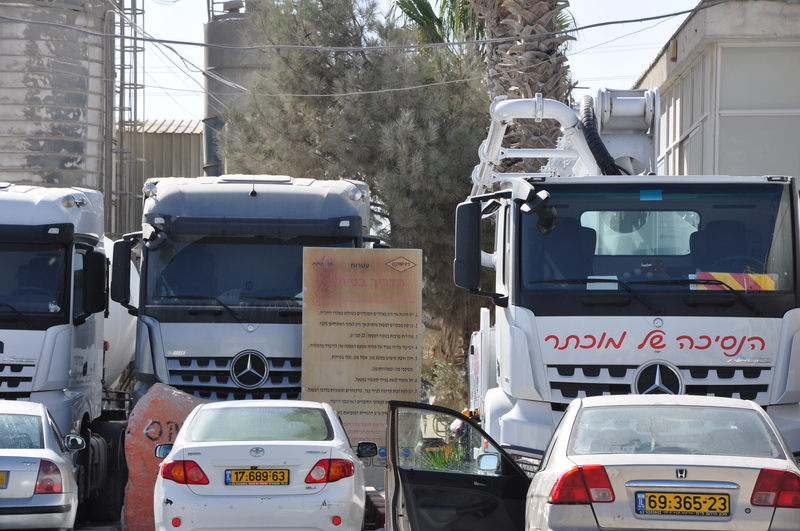 Only one sign with a small logo in the factory area itself, along with the name “Readymix” in Hebrew on the parked trucks, reveals that the factory belongs to Readymix. We attempted to contact both Readymix and Cemex numerous times, via telephone, email and website contact form. We would have liked to ask Cemex how the company is able to operate three factories in the occupied Palestinian territories without contributing to violations of international humanitarian law and human rights, but Cemex chose not to respond to our enquiries. In addition to its three factories, Cemex owned until recently 50 percent of the Yattir stone quarry on occupied Palestinian land. 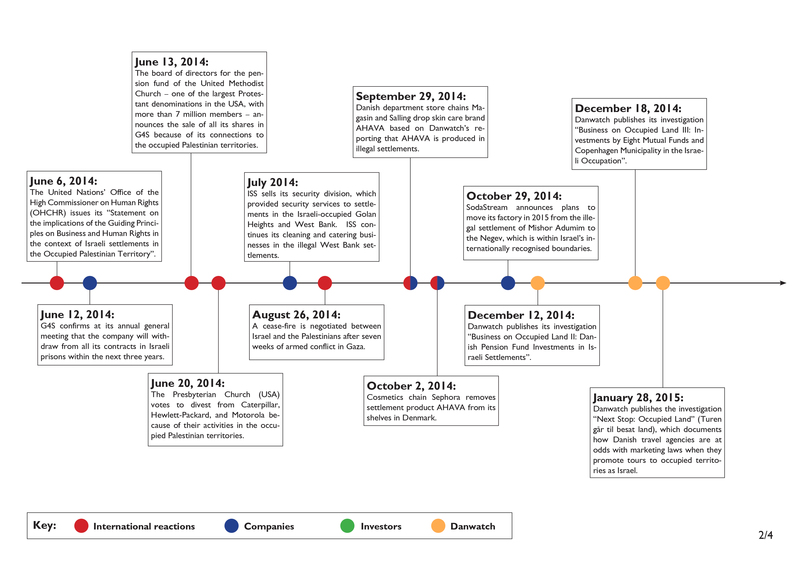 After many years of international condemnation, Cemex chose to sell its equity stake in June 2015 – the same month that the Norwegian pension fund KLP announced that it had added Cemex to its exclusion list of companies in which it would not invest. 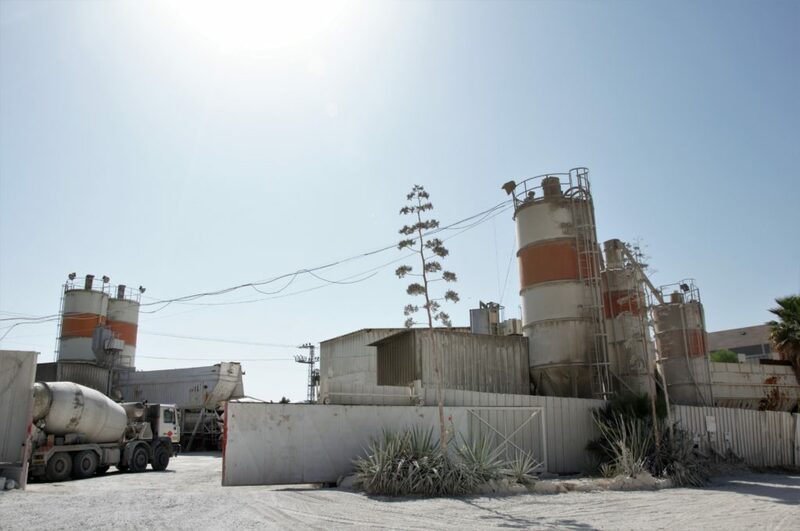 In September 2015, Cemex replied to a question from the Business & Human Rights Resource Centre about the three factories on occupied land, saying that it was simply following Israeli law, which permits settlements. As mentioned earlier, Cemex’ definition of the legality of settlements directly contravenes all international bodies, treaties and governments around the world, who consider all Israeli settlements on occupied territory as illegal. According to Israeli media, the Mexican cement giant has put Readymix up for sale for €450 million. Potential buyers are said to include Apax Israel, FIMI, Oak Tree, and KKR, one of the world’s largest investment companies. 1. Our research indicates that Readymix operates three cement factories beyond the green line. Is this correct? And are these factories all the activities Cemex (through Readymix) have beyond the Green Line at the moment? 2. Are there any current plans for moving the three factories inside the green line? 3. Does readymix have contracts with the Israeli defense authorities such as IDF or Ministry of defense in construction of military facilities or the Separation barrier? 4. Does Readymix provide cement or other services to construction projects in settlements currently? 5. What is your response to people who claim that operating factories on occupied territory in unethical and possibly illegal under international law? 6. What is your response to people who think that Cemex and Readymix should be targeted for boycott, divestment and sanctions? 7. Has Cemex and Readymix been affected at all by these calls for boycott, divestment and sanctions? Is this still your position or do you have anything to add? 9. From news reports it seems Cemex is looking to sell off Readymix. Is this correct? And is it because Cemex wants to avoid unethical and possibly illegal activities beyond the Green Line? European investors claim to adhere to the United Nations Guiding Principles for Businesses and Human Rights, even as they earn money from the activities of Israeli banks in illegal settlements. What are investors’ actual responsibilities when they invest in companies with business on occupied land? Israeli banks have a significant presence in illegal settlements, where they finance the construction of homes and infrastructure, operate local bank branches, and offer mortgages and other banking services to settlers, businesses and settler authorities. There are different ways of looking at corporate social responsibility, but according to CSR specialist Steen Vallentin, a lecturer and PhD at the Copenhagen Business School, there is no doubt that the Israeli banks contribute to serious violations of human rights in the occupied Palestinian territories. “Normally, one would look at the level of engagement, so that if it’s a big multinational company, and the questionable activities make up only a small part of its business, you could argue that it’s not that worrisome. But in the case of these banks, there is no doubt. They supply the lifeblood of the entire illegal settlement apparatus,” he says. Danwatch’s screening show that the top five European investors have all in all €332 million in five Israeli banks, which all have activities in the occupied Palestinian territories. Again, the Norwegian oil fund is by far the largest of the five investors with investments in all five banks totalling €235 million, while the Dutch pension fund Stichting Pensioenfonds ABP has €97 million in three banks. Danish Arbejdsmarkedets Tillægspension and Swedish Alecta Pensionsförsäkring has no investments in the five banks, while the Dutch fund Pensioenfonds Zorg en Welzijn has excluded all five banks because of their involvement in the financing of settlements in the occupied Palestinian territories. Danwatch has asked both the Norwegian oil fund and Dutch Stichting Pensioenfonds ABP about their investments in specific Israeli banks. Stichting Pensioenfonds ABP has not replied while the Norwegian oil fund answered in general terms about their investment strategy and not specifically about why or how they believe Israeli banks adhere to G20/OECD Principles of Corporate Governance, the OECD Guidelines for Multinational Enterprises, and the UN Global Compact, which the oil fund explicitly expect all companies they invest in to follow. In Steen Vallentin’s opinion, that is not good enough. “I think we can expect more than the classic fig leaf answer that the investors have an ethical investment policy, but that they don’t comment on individual investments. You can sweep quite a lot under that rug without giving outside parties a chance at verification,” he tells Danwatch. Cathrine Bloch Veiberg, an expert in corporate responsibility at the Danish Institute for Human Rights, says that the United Nations Guiding Principles on Business and Human Rights (UNGP) do support active ownership via dialogue. Investors who find potential problems in companies they invest in aren’t necessarily forced to sell off and exclude the companies. Active ownership, however, requires that investors are open with respect to the process. “Businesses do not necessarily have to sell when they are made aware of potential problems. They can attempt a dialogue with the company in order to deal with the potential negative effects on human rights. But they must demonstrate that they are doing so by communicating it publicly,” she says. In this case of Danwatch’s investigation, that would be the Palestinians in the occupied territories whose rights are being violated by illegal settlements, checkpoints, the separation wall, or the exploitation of natural resources. According to Steen Vallentin, there are also structural problems that dissuade many investors from being open about their investments. “In general, investors have no incentive to talk down the value of their investments by being overly critical of a business in public. Unless they are getting ready to pull out entirely, why in the world would they drag the business’s name through the mud?” asks Vallentin. At the same time, however, he thinks that we can expect a greater degree of openness surrounding some of the central challenges that investors face when choosing where to put their money. At the international level, the question of the corporate responsibility in the occupied Palestinian territories has received increasing attention over the last few years, as a number of NGOs, companies, countries and international organisations have taken concrete steps toward holding investors and businesses responsible. In his 2012 report, which focused on the legal responsibilities of corporations, UN Special Rapporteur to the occupied Palestinian territories Richard Falk warned national governments significant risks of conducting business in the conflict area. For that reason, he said, governments should warn companies that they could face consequences if human rights violations occur as a result of their business activities. In the EU, too, the question of corporate responsibility has received mounting attention, and so far eighteen countries in the bloc have published recommendations for their citizens and businesses regarding financial and economic activities in settlements. Hugh Lovatt, a policy fellow at the European Council on Foreign Relations, sees the warnings from EU countries as a natural consequence of the bloc’s so-called “differentiation policy”, which makes a clear distinction between Israel and the occupied territories. “When a lot of agreements were signed with Israel in the late 1990s and 2000s, at the height of the Oslo peace process, the settlements were viewed as a temporary feature of Israel’s occupation. Everybody thought a peace deal was imminent and would therefore make them moot. So a lot of the agreements with Israel were not designed with explicit territoriality clauses. This means they don’t adequately exclude settlements, which allows Israel to interpret settlements as a part of the agreement” he explains. The EU-Commission and its member states are now trying to correct this misunderstanding via a series of different initiatives, including informing citizens and businesses about the risks of association with the illegal settlements. 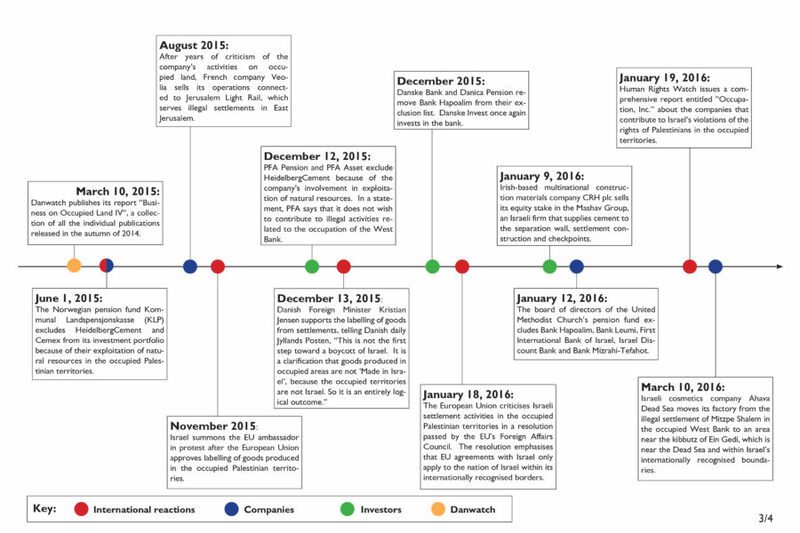 The EU-Commission, however, has not yet issued an official warning like 18 member states has. “It’s been slowly building, but it’s an important step down this path of differentiation, of legal necessity, where the EU is waking up to the potential consequences of not differentiating between Israel and the settlements,” says Lovatt. According to Lovatt, countries have a responsibility to ensure that companies operating under their jurisdiction are fully informed about their obligations and responsibilities under applicable law. “A lot of companies don’t know what the reality is. They hear from Israel and their partners that these issues are disputed, so they’re simply not fully cognisant of what the law actually says. So the business advisories are part of a process of explaining to businesses, banks and investors what the situation is, so they have the option of aligning their practises with international law,” he says. 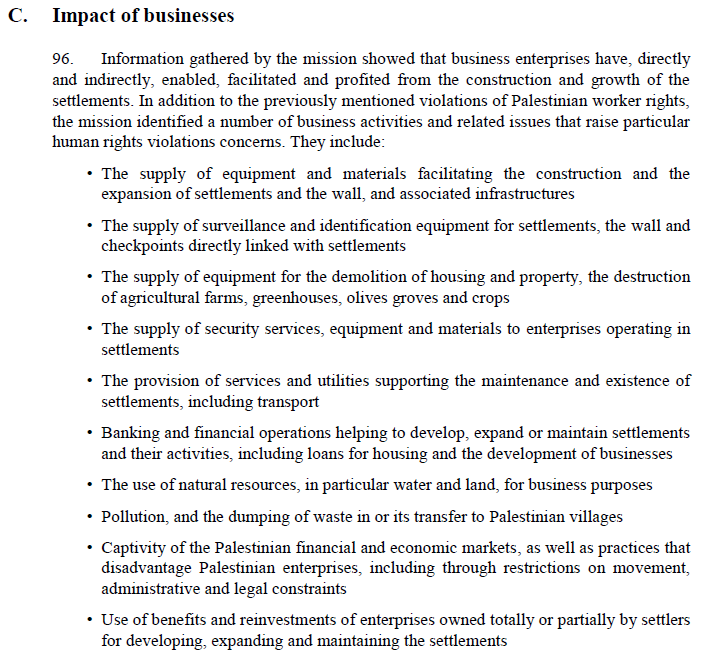 Overview of which business activities to be included in the UN High Commissioner for Human Rights list of companies with links to illegal settlements. Recently, the UN’s Office of the High Commissioner for Human Rights decided to establish a database of companies with connections to illegal settlements. According to the resolution, the database is to be presented at the 34th session of the Human Rights Council, which will take place February 27-March 24, 2017. 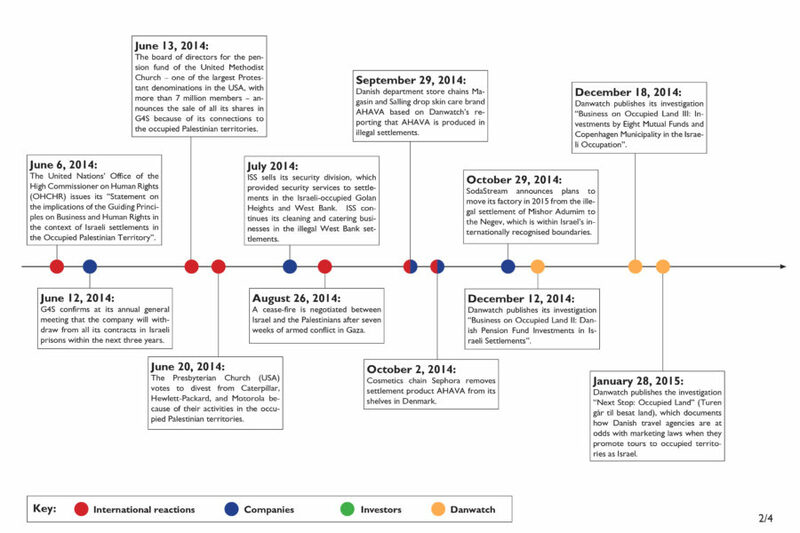 The types of connections that merit inclusion on the list are described in a February 2013 report to the Council, but according to several sources Danwatch consulted, the formulations in the 2013 report are so vague and undefined that it is difficult to predict which companies will be included in the database. One of the organisations that has made a recommendation to the Council is Human Rights Watch. They outline the kind of business activities that they believe meet three of the criteria outlined in the Resolution, and also recommend the inclusion of three specific companies: HeidelbergCement, which operates a quarry in the West Bank; Remax, which sells homes in settlements; and FIFA, which arranges football matches in settlements via its Israeli partner, the Israel Football Association (IFA). Europe’s five largest pension funds have combined investments of €7.5 billion in companies with business activities in and around illegal settlements in the occupied Palestinian territories. This is at odds with United Nations guidelines, clear warnings from 18 European countries, and undermines the two-state solution, experts warn. Danwatch visited the West Bank including East Jerusalem. This investigation was funded in part with Danwatch’s own resources and in part with contributions from organisations including Folkekirkens Nødhjælp and Mellemfolkeligt Samvirke.